The Navy calls their enlisted jobs ratings, and groups similar ratings into communities. 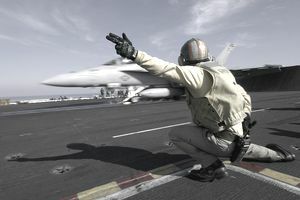 There is a wide range of ratings under the Navy's aviation community, many of which take place aboard aircraft carriers. These sailors are tasked with all manner of jobs surrounding Naval aircraft, from ensuring safe takeoffs and landings to traffic control monitoring weather conditions. Most of the aviation community's training takes place at the U.S. Naval Aviation School in Pensacola, Florida. Here are a few of the ratings that are under the Navy's aviation community. Sailors in this rating prepare and fuel planes before take-off and after landing on aircraft carriers. They are responsible for maintenance on hydraulic and steam catapults, barricades, and other equipment, and operate firing panels, water brakes, and blast detectors. Most of their work is done aboard an aircraft carrier, in all kinds of weather, in fast-paced and potentially dangerous conditions. The job of a Navy air traffic controller is very similar to its civilian counterpart. They're responsible for directing aircraft operating in different environments, from airfields to the decks of aircraft carriers. They control the movement of aircraft and vehicles on airfield taxiways and issue flight instructions to pilots by radio. Following "A" school, air traffic controllers spend one to two years getting on-the-job training at their first duty station. This includes individual training leading to certification at that airfield facility. Air traffic controllers may be stationed anywhere there is a need, including at traffic control centers, aircraft carriers, or at air traffic control facilities. Aviation machinist's mates are aircraft engine mechanics and keep the gears running. They repair, inspect and overhaul aircraft engines and propellers. They'll also do routine maintenance and help prepare aircraft for flight. They may also volunteer as Naval aircrew, where they earn additional pay for performing in-flight duties and operating aircraft radar and weapons systems. Technicians going to intermediate level maintenance facilities for their first assignment will attend advanced training after "A" School. These are the Navy's aircraft electricians. They maintain a wide range of electrical and navigational equipment, including power generators, power distribution systems, lighting systems, flight instrument, and fuel systems. They may also volunteer to fly as Naval aircrew. Aerographer's mates are trained in the science of meteorology and physical oceanography. They learn to use instruments to monitor air pressure, temperature, humidity, wind speed, and direction and are tasked with distributing this information to aircraft, ships, and shore activities. Aviation ordnancemen are weapons specialists charged with storing, servicing, inspecting, and handling weapons and ammunition on Navy aircraft. Their duties include stowing and assembling aviation ammunition including aerial mines, torpedoes, missiles, and rockets. They assemble and test air-launched guided missiles, and supervise stowage of ordnance. These technicians may also volunteer to fly as Naval aircrew. The AW rating is divided into three categories: acoustic (AWA), non-acoustic (AWN), and helicopter (AWR/AWS). AWA sailors perform general flight crew duties, operate airborne mine countermeasure equipment, act as flight communications operators and flight attendants. AWN sailors perform general flight crew duties and perform specified pre-flight, in-flight, and post-flight operations in naval aircraft serving anti-surface, mine countermeasures, electronic, counter-narcotics, and land and sea rescue warfare missions. AWR/AWS sailors operate tactical weapons, sensors, and communications equipment, do in-flight maintenance, work with pilots to operate and control aircraft, perform mine countermeasure detection, rescue downed pilots with emergency first aid, and perform duties of flight attendants and loadmasters. AWs may work in hangars, shipboard hangar, and flight decks, administrative and operations departments. They often work on flight lines at air stations, usually around a high level of noise. Aircrew survival equipmentmen (PR) have a pretty important job aboard Naval aircraft. They're the ones responsible for keeping parachutes, life rafts, personal flight gear, and other aviation survival gear like oxygen converters and regulators in working condition. They may also volunteer to fly as Naval aircrew.